Exclusive! A bag for all your treats (and tricks)! 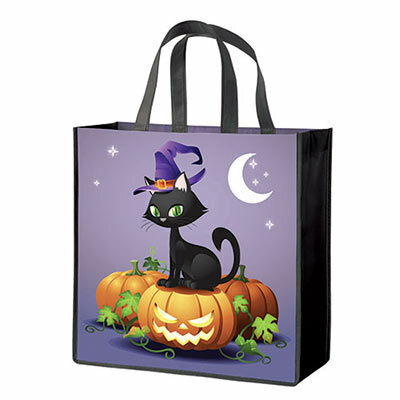 Darling black cat is printed on both sides of this durable, take anywhere, tote. Makes an ideal Beggar's Night bag, or take it along to the grocery, library or office and show off your love for the spookiest holiday. Features a non-woven polyester coating for easy wipe-off cleaning. Imported. 14"w, 12"l handles. Limited Quantities!